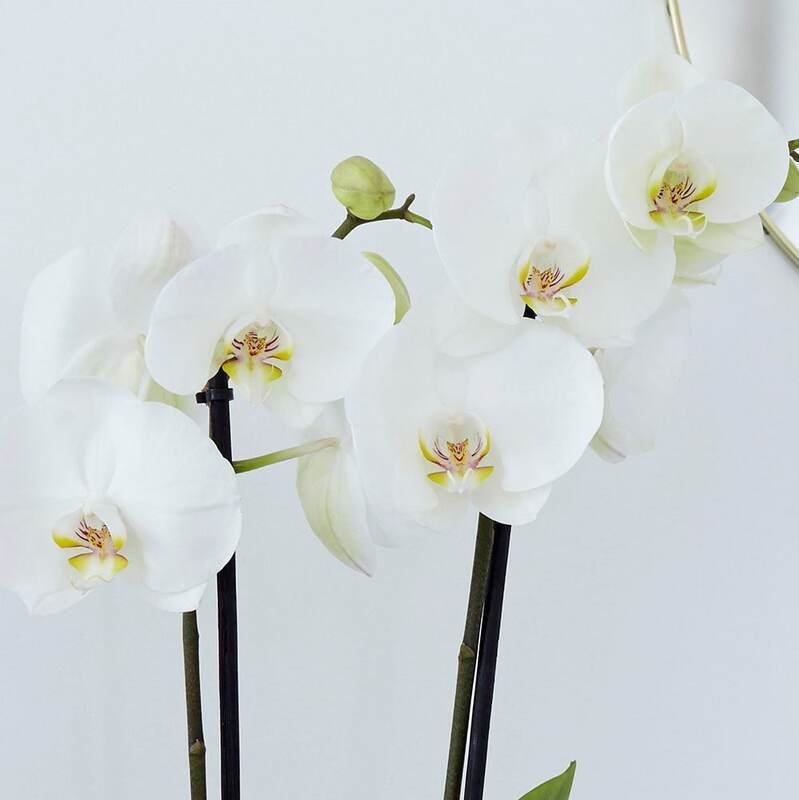 Buy Phalaenopsis grandiflorum 'White' moth orchid: A great gift that will carry on flowering for ages. Pot cover: choose a 12.5cm orchid pot cover to give a good fit over the pot. This orchid will make a great gift, that will carry on flowering for ages. Its two stems are laden with buds and flowers, and between them will produce at least 12 buds or flowers. 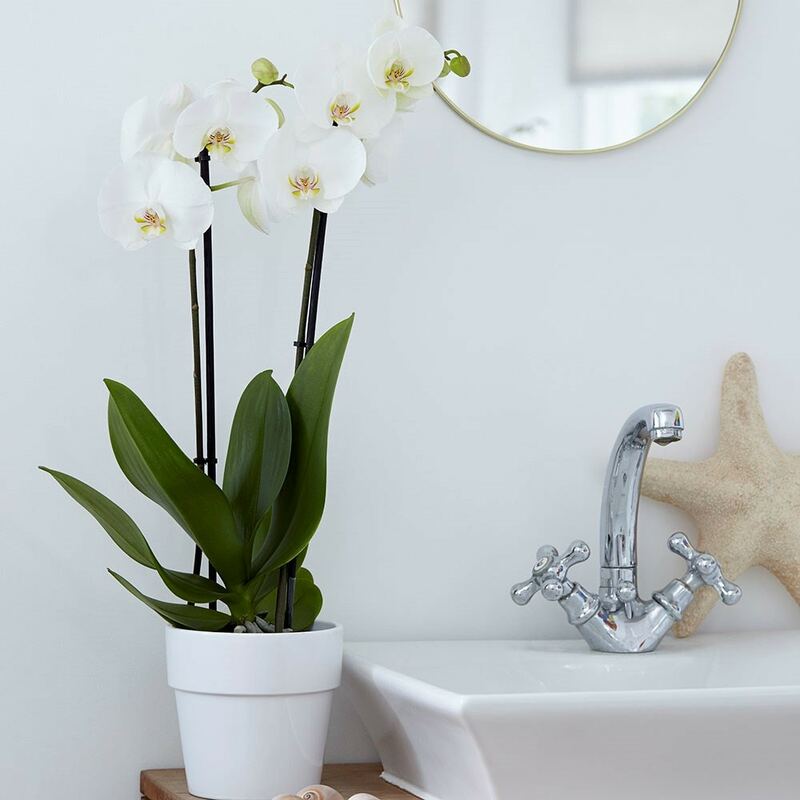 The flowers are subtly elegant, and being white, will fit into most settings effortlessly. Please note that the pot in the photograph is not supplied with the plant (which is sent out in a black plastic pot). They do however make excellent potted plants, and if you wish to pot yours up, we do have a wide range of pots on our website to choose from. Home care: Keep the compost moist during the warmer months, but in winter you should reduce the amount it gets, and only water them occasionally. Ideally when watering, you should let them stand in a tray of water (or kitchen sink) so they can soak up as much as they like for an hour or two. Afterwards, let the excess water drain away completely. It is always best to give them a a good soak when they get quite dry, rather than watering little and often. Their preference is for soft, tepid water. They love humidity, so a bright kitchen or bathroom would be ideal, and mist the leaves with water occasionally, especially if they are in a heated room. Don't worry if the roots grow outside the pot. In their native environment, they grow in the crooks of branches, and use these aerial roots to absorb water from the air. They do not mind being overcrowded in their pots, so you only need to repot them when the growth starts to suffer. They usually only send up flower spikes once a year, however you may encourage a second flush of flowers to form more quickly if you trim back the stem to just above the first node immediately after they have finished flowering. They prefer even temperatures, so try not to have big drops at night time.